John Stuart Power Brake is Canada's premier custom automotive parts remanufacturer. Don't let our name mislead you. We not only remanufacture automotive, heavy truck and industrial brake parts, we also remanufacture, not rebuild, Steering Parts, Water Pumps, and more! 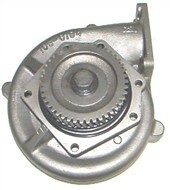 Here at John Stuart, we specialize in remanufacturing brake parts for vintage and antique cars. We sell high quality brake pads and rotors for most vehicle applications, and offer both Disc Brake Conversion Kits and Power Brake Conversion Kits for Antique Vehicles and Street Rods. At John Stuart Power Brake we also offer full Machine Shop Services, Custom Made Parts and Stainless Steel Sleeving. Located in Stoney Creek, Ontario, Canada we ship Worldwide. We back everything we remanufacture with a full One Year Unlimited Mileage Warranty. We accept Visa and Mastercard. Please check our site frequently as we are constantly adding new information and products. Thank you for your interest in John Stuart Power Brake Co. Ltd.